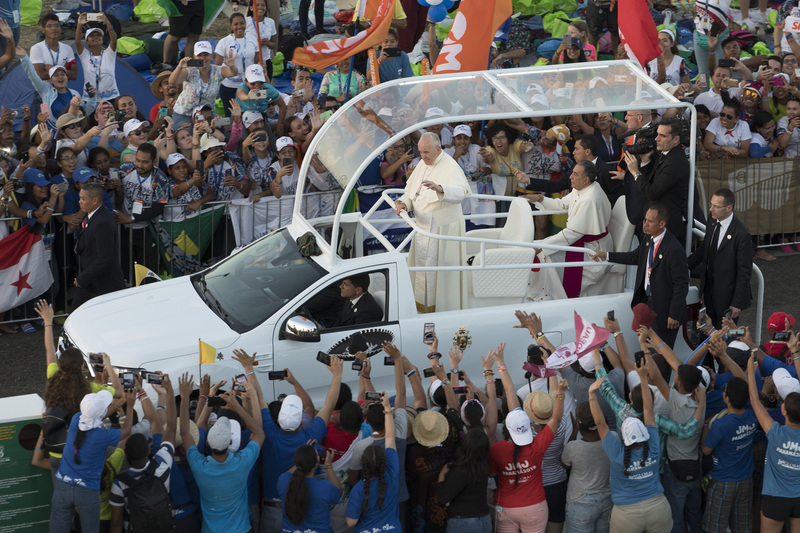 PANAMA CITY (Crux) — Speaking to over half a million young people from around the world on Sunday, Pope Francis said Jesus is not “an interval in life nor a passing fad,” but a loving God who’s concrete and close. To avoid heatstroke among those who spent the night out in the field, and who had to walk back to the city once the Mass was over, the celebration began at 8 a.m., though warm-up presentations, designed to wake the young people up with enough time so that they could have breakfast before Mass, began right at 6 a.m. Ahead of the pope’s arrival, Crux spoke with several pilgrims, most from Latin America, and all from countries that wanted to see the pope refer to their own situation, either due to political turmoil or because of crisis within the Church. Siori, 22, requested her last name be kept confidential because she comes from Venezuela, and is afraid of facing reprisals when she heads home. She began saving money to participate since Panama was announced as the host city in 2016. “Up until the last moment, I wasn’t sure I’d be able to come,” she said. Yet her brother, who fled Venezuela three years ago and currently lives in the United Kingdom, helped her cover the cost of the plane ticket. Seeing the current crisis in her country, Siori’s hopes were that Pope Francis would say something to the people of Venezuela. Martin Alvarado from Guatemala, came with his group of some 60 pilgrims at dawn on Saturday to claim first-row seats in a field that opened six hours after his arrival. Laura Martinez, a pilgrim from Chile, said her group had debated about whether to attend WYD: The crisis in the local church, with eight bishops under investigation for covering up clerical sexual abuse, is only the tip of the iceberg. Several presidents of Central American nations, and the president of Portugal, were on hand. At the end of Mass, it was announced Lisbon, Portugal, would be the site of the next international World Youth Day in 2022. In a sense, the pope emeritus was present throughout the entire week, always eliciting loud cheers when Pope Francis mentioned him. During the opening ceremony, the pontiff said that his predecessor was “watching us on TV” and urged the hundreds of thousands who had gathered to send their greetings to the German pontiff, which they readily did.